Srila Prabhupada was determined to spread the teachings of Krishna consciousness even as his business collapsed, first in Allahabad, and then in Bombay, during the 1930’s. He had diligently written his commentaries on the Bhagavad-gita for over a decade and was hoping to find a sponsor who could help publish his writings. After more than fifteen years he finally contacted a wealthy donor from South India who agreed to sponsor his works. 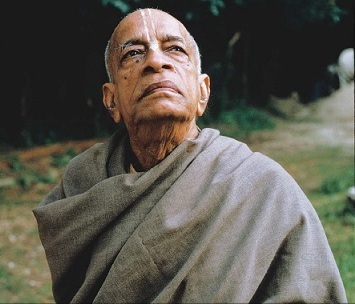 Excited, Srila Prabhupada went home, and to his dismay discovered his manuscripts missing. He asked his family, servants and even neighbors, but no one had any idea where and how his years of hard work disappeared. Not the one to be discouraged, he rewrote the whole manuscript, and eventually the Bhagavad-gita As It Is went on to become an internationally renowned contribution of Srila Prabhupada that helped transform thousands of lives. During his initial days in New York City, hardly anyone attended his talks on the Gita. A few old men and women came, but they had little interest in the process of Krishna consciousness. On one occasion, Srila Prabhupada confessed in his address to this motley crowd that he was missing Vrindavan, which he had left to come to this distant place. His heart hankered to be back in the sacred temples of Vrindavan. “I am not happy here,” confessed Srila Prabhupada and a few of the attendees concurred that they too perceived he isn’t happy in America. Then Srila Prabhupada in a spirit of never-say-die attitude declared, “I am not going back. I have come here to fulfill the order of my spiritual master and shall teach Krishna consciousness even if few people come.” And in just another ten years, he was able to penetrate each continent of the globe with over a hundred centers, thousands of students, and millions of well- wishers. Krishna consciousness was here to stay. While struggling alone in the harsh winter of New York in 1965, he repeatedly corresponded with his friends and acquaintances in India for help. None from India responded. Not the one to be discouraged, he motivated the local young Americans to help his cause, and he spearheaded a revolution that was soon to engulf the world with the culture of singing and dancing in love of God. During his quiet initial struggle to plant the seed of Krishna consciousness in the western world, he was alone, but not lonely. He daily chanted Krishna ’s holy names, cooked and offered food to his beloved Lord Krishna , and lovingly remembered and spoke about Krishna to whomsoever he met. Once while sitting alone in a park, a Mr. Reuben was fascinated by him and asked who he was and what he was doing in New York. Srila Prabhupada said he was teaching God consciousness and had hundreds of centers and thousands of students, and many books and periodicals in over a dozen languages. The whole thing seemed incongruent to Reuben who was convinced this was an old man, all alone in this big bad city of New York. Yet history has borne witness to Srila Prabhupada’s amazing foretelling in the park; he was optimistic, and was fixed in his vision to see Krishna consciousness spreading in every town and village on this planet. Even during the last few days before his departure from this material world, while his body was pale, and it was obvious he’d be leaving soon, Srila Prabhupada was translating the Srimad-Bhagavatam. A disciple would hold the dictaphone close to him, while he slowly spoke the translations, in a way that was audible and understandable for audiences over the next ten thousand years. Srila Prabhupada was truly an ambassador of the spiritual world, the abode of Krishna where everything is ever fresh and new. Srila Prabhupada defied old age, and encouraged everyone to be positive and enthusiastic at every moment of their lives in service to God and humanity.